Effective biocide QAP 200 confirmed by independent tests. Eradicates offensive odours from all types of fabric. Sanitises and freshens laundry that cannot be boiled. Helps prevent static build-up in synthetic fabrics. 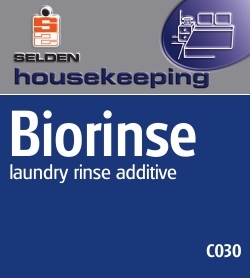 Biorinse is especially suitable for hospitals with geriatric wards, old peoples homes, nursing homes, hostels etc. to help prevent cross infection. Add Biorinse to the final rinse water at 1 part to 200 parts water. Composition An aqueous blend of quaternary biocides incorporating a fresh perfume. Stability 2 Years Shake before use.